Like how this cut-ten even happen? Can someone explain it to me, the mechanics in how to pull this off, coz I only know Visual Basic 6. I assume you used the sell instantly option and did so before the tp had loaded the current buy and sell orders. Afaik the tp initially uses as default the "minimum worth" thats coded for the item, and updates this to the current highest buy order once it loaded the data. If you sold the items before the tp had the chance to load said data, your items are sold at the "default price" and the buyer gets the items and additionally the difference between his order and the default price back. Not 100% sure on this though. If that is the case, i wonder are we seeing more and more of these recently due to the fact the TP has been running super slow, they are clearly having a server issue with regards the TP. 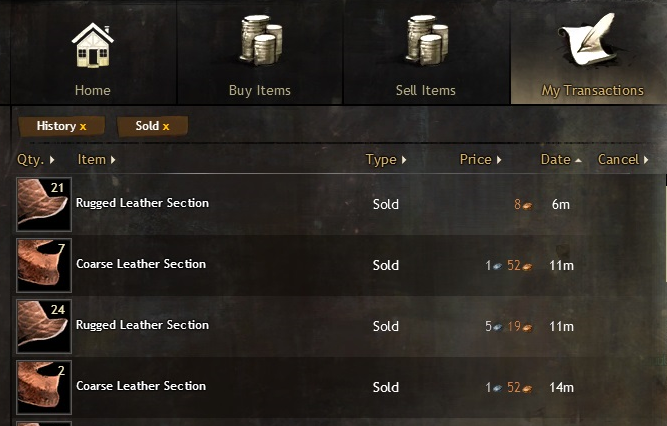 If you press Sell Now before the TP has managed to load the current buy- and sell orders you'll sell at the minimum price allowed (vendor value+15%). oh yeah? loading time should not affect the value coz even a .exe processing data will always lead to the processed data. for a web app, a process will always wait for the right data to be displayed and used. if your opinion is what it is, the TP is badly coded then and you can technically sell Eternity for 8 copper. which is not bad, after all. Yes, you can technically sell Eternity for a ridiculously low price. If I'm reading the API info correctly, its "vendor value" is 10 g, so lowest possible TP order would be somewhere around 11.8g. The thing is, when selling too fast like this, you're still manually confirming the price. Until the TP orders have loaded, the minimum price sits there in fairly large font right in the middle. still, sounds like a bork bork thing. the last offer should be on top as always and there should be no "bugs"/"exploit"/"patch" like this. i would just like to know if you can replicate this, or is it only on my client? Oh it's definitely a bit borked! Probably not so much a bug as a cut corner, but we have to ask ourselves - if they implemented a lock so that you can't sell before the orders are loaded, how much more time would the loading take, since you have to throw in checks along the way? no excuses. the TP has to sell at correct price. loading is not even an issue here coz you won't like wait 1 century to load the proper prices, right? Loading is absolutely an issue - how else would the TP know what current highest buy order is? It takes. Forever. To. Load. Things. On. The. Tp. Ever. Since. The. Rune. And. Sigil. Changes. look at the increments on the picture if it takes Forever to load things. the 2nd item and third item was sold in almost at the same time. so tell me what is forever. I would think the wait would be implemented on the client side and would therefore not impact the TP. I'm not sure the CS Team would be willing to remove items from someone that, through no fault of their own, got a deal on some items. Nor be willing to create Gold out of thin air to replace that which was lost. I suppose it might be worth a try for that <1 Gold. The TP has been horrible. Its loading is so slow. I don't ever remember it being this unresponsive before. Makes me think it's so dynamic at the moment with so many players conducting transactions all at once. But, if that's the case, it needs to be overhauled so the performance is improved. but 8 copper.. from 5 silver and some copper.. in less than 5 minutes. Becouse you dident let it load mate its all on you. all on me? lel. kitten. the tp loaded 8 copper and all on me? did you mean i caused the TP to load 8 copper? or you mean all on my "laced" client. most likely that. Yeah. those 8 copper are a price you yourself have accepted. It's not Anet's fault you didn't look at the screen first. it should LOAD the right amount. pile up and condone that BUG. i get the game. Yes, it should. You still should check it, though, so it's your fault as well. i don't care if i got "robbed" with some copper. i just wonder why these things happen/allowed to happen/[loopholed/patched] to happen. they could easily disable the "Sell Now" before the right Amount is Loaded and once its loaded, it is enabled.